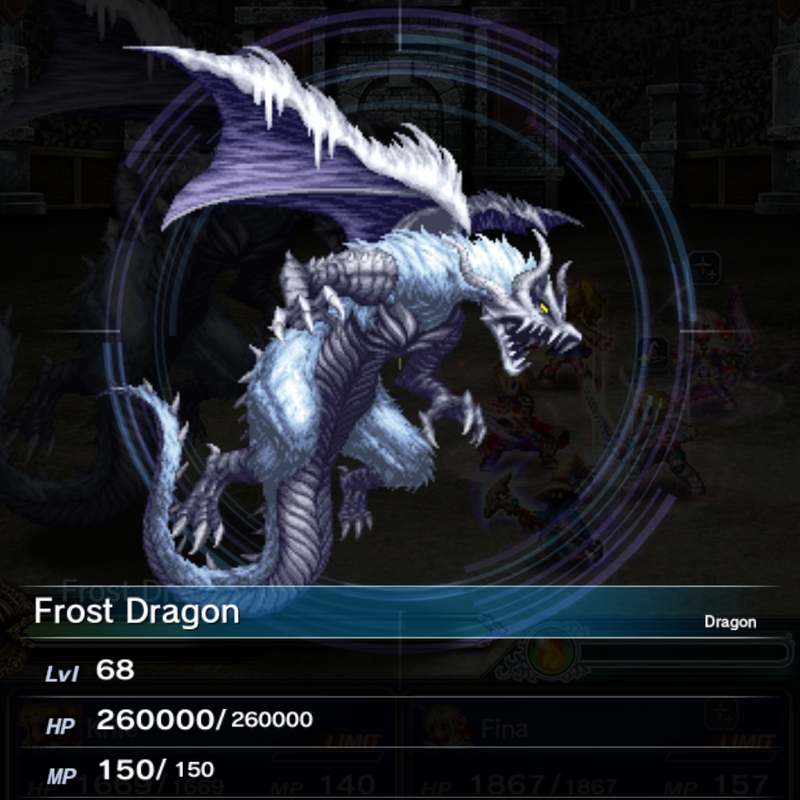 There is a published moveset for the Frost Dragon (FD) which is pretty simple, much like that of the Lesser Lobros which, surprisingly, gave me a harder time than FD (most likely because I didn’t have Full Break then yet, and that dragon type is immune to sleep ><): a 4-turn cycle with a Blizzara at the end, devastating unprepared party members with a follow up bite and/or screech (casts confusion). FD gets three moves every turn and the 4 turn counter includes time when FD is either paralyzed/silenced/sleeping. I’ve read about the FD whilst browsing thru reddit for something else, some people are having problems with it but that is to be understood with a monster who cant even be poisoned; which is currently the fastest way to get a boss’ HP into the red (giving 10% damage each turn Poison status is active). 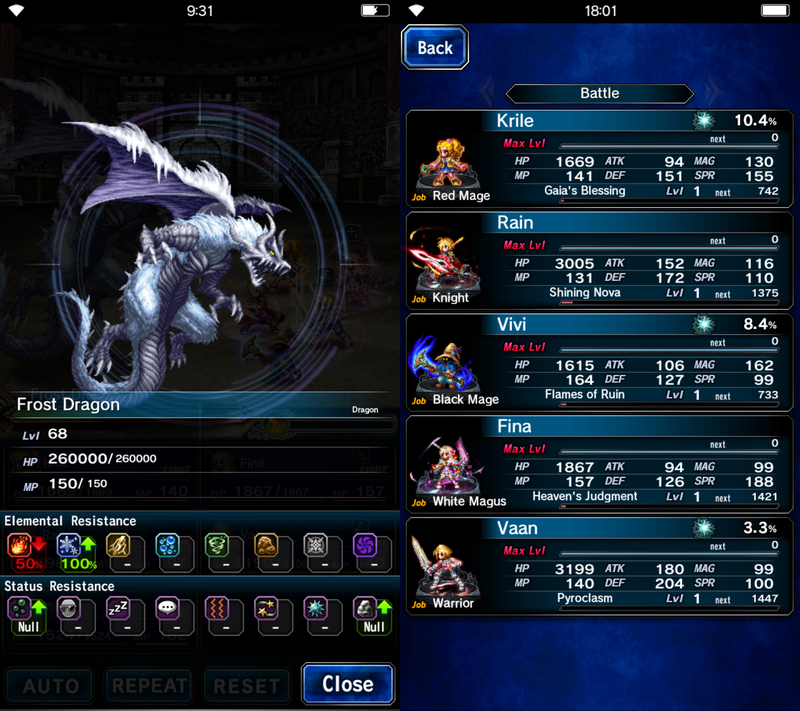 I’m running practically the same setup with two dualcast mages in Krille and Vivi, a healer in Fina, a pseudo-tank with Vaan, and an all around support in Rain (I chose Rain because he has the occassional counterattack, and with the Flametongue, its a good chunk of reduction to FDs HP). None of my Espers have reached 2* yet and this battle ran without Ifrit equipped. 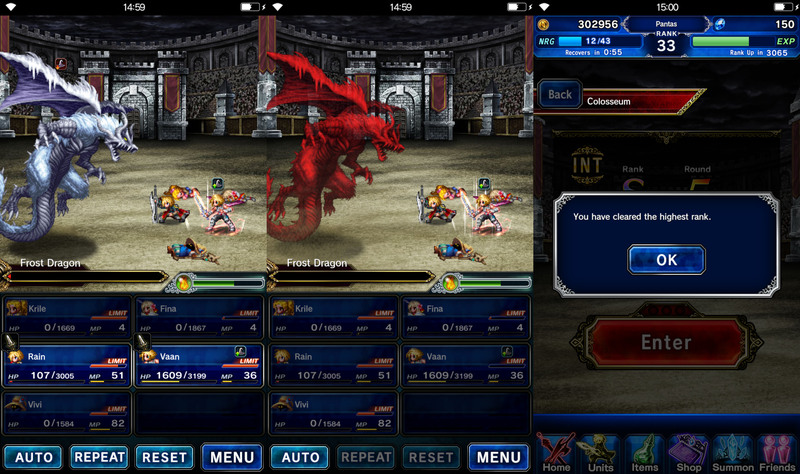 My method utilized one Sleep Dagger on Vaan, the Flametongue on Rain, and not much out of the ordinary. What is peculiar with our battle was a few times during the latter part of the encounter, FD would occasionally hit itself with its own attack, this without any confusion status being applied. The icing on this takedown is my final attack which was Vaan’s LB – Pyroclasm. It was our fourth battle when FD finally bit the dust. The takeaway? A recipe for Turbo-Ether. Stay tuned for more FFBE updates as the game does so. I’ve yet to get my hands on hero rings or any of the special trust masteries but still, the team manages for now.